Our mehndi cake designs are inspired by the many beautiful henna patterns. The designs can be adapted to your colour theme and work as tiered cakes or individual cakes. Our cakes are halal, they are vegetarian and do not contain alcohol. We make a range of cake flavours, the most popular are sponge, chocolate, red velvet or white velvet. For more cake flavours see our Flavours page. 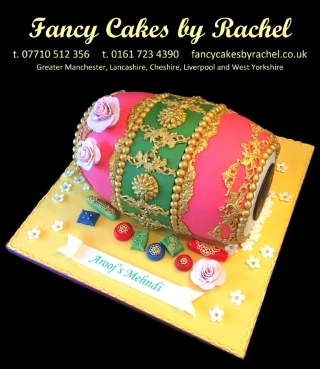 We give a discount on Mehndi cakes if you order your wedding cake from us at the same time. We have a range of cake stands, including water fountains and crystal pillars to display your cake. There is a small hire charge for stands and a refundable deposit which is returned when you bring the stand back. Hire of stands is for 3 days. Delivery is free to local venues depending on the size of your cake. Please contact us for more details regarding delivery.